I’ve long believed that timing is important in life. 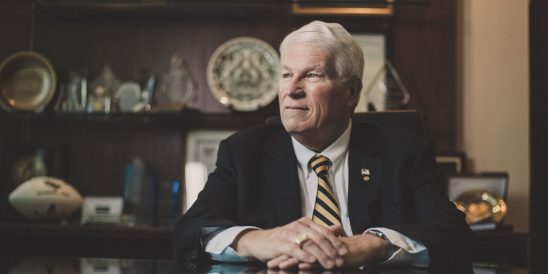 Almost 26 years ago, the time was right for me to become UCF’s fourth president. Today, the time is right for me to retire. With the firm belief that the future is bright for UCF, I will step down as president effective June 30, 2018. I make this decision in good health and of my choosing. The time is right for this decision because I’ve never felt better about UCF. This is a special moment in time for the university: we are hiring hundreds of talented new faculty; attracting the highest-achieving students in our history; and making impacts in Orlando, the state, and nation. I am proud of our reputation as one of the biggest and best universities in the country. Through our size and constant pursuit of excellence, UCF changes the lives of our students … and our students change the world. Making this decision now provides the best opportunity for our momentum to continue. I know that our leadership team, including our trustees, vice presidents, and deans, will continue turning big dreams into reality. UCF Board of Trustees Chairman Marcos Marchena will convene a search committee that will include trustees and representatives from the faculty, staff, student body, alumni, the Florida Board of Governors, and the Central Florida community. We will soon share additional information about the presidential search process. Since 1992, Martha and I have been honored to work alongside many exceptional people. Being at UCF has been one of the greatest joys of our lives. When we first visited campus, we had a powerful feeling that UCF was a special place. We could never have imagined then how special it would become. Thank you to everyone who has made our remarkable university what it is today. Martha and I are forever grateful for your support. End of a great era. Thank you! One of the highlights of my education was to meet you and shake your hand. I then understood that your dedication to the UCF family was boundless and fierce. Thank you for your leadership.